Apparently there are a lot of people in North Dakota who like to tell perspective employers that they like pizza. I have only ever submitted resumes to media companies so clearly I have no idea what is going on here. Apparently it is normal to list an 'Additional Interests' section on your resume. I'll be completely honest with you. I have never heard of such a thing and don't understand why this would be important under any circumstance. They analyzed over 3 million resumes and looked at the 'Additional Interests' section on each one. Again, I still have no idea why this is a thing. 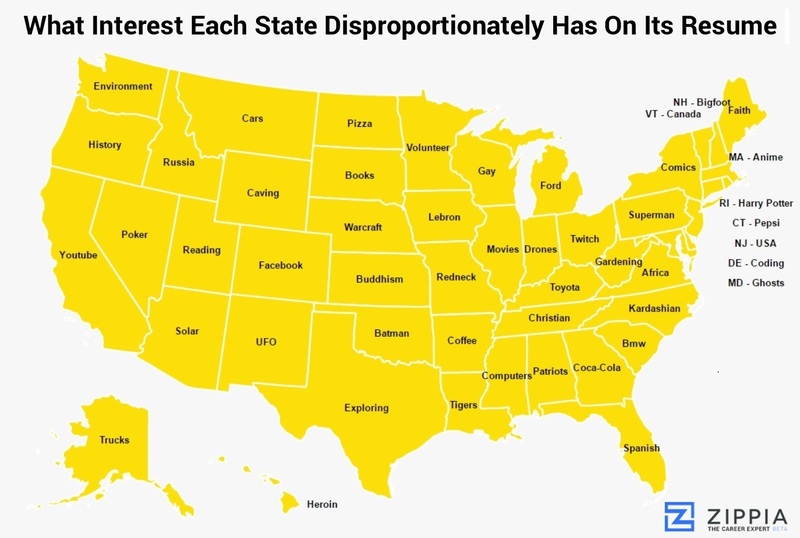 In North Dakota, apparently job seekers list 'pizza' in that section more than any other state. When looking at the entire map, every state had something unusual listed. I suppose it is weird, but how would I know? I feel like pizza is a normal thing to like. If you are going to put an 'Additional Interests' section on your resume, what are you supposed to actually put there that isn't considered weird? Stop putting an 'Additional Interests' section on your resume. Your love of pizza, Russia, tigers, and ghosts probably definitely won't help you get the job.